I have found that Future is a lot easier to airbrush when thinned. It was however, slow going as I let the Future cure for a day between layers. In the end though, I got a decent result out of it. 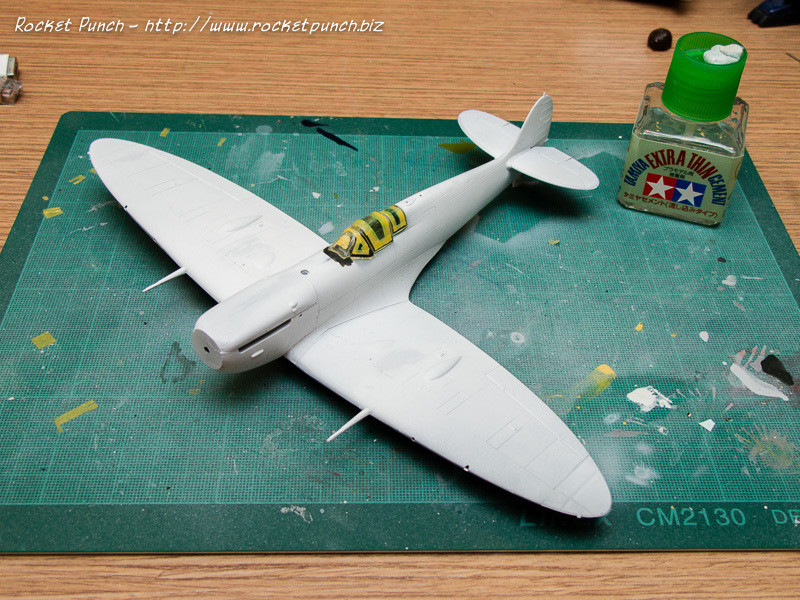 Time for decals! 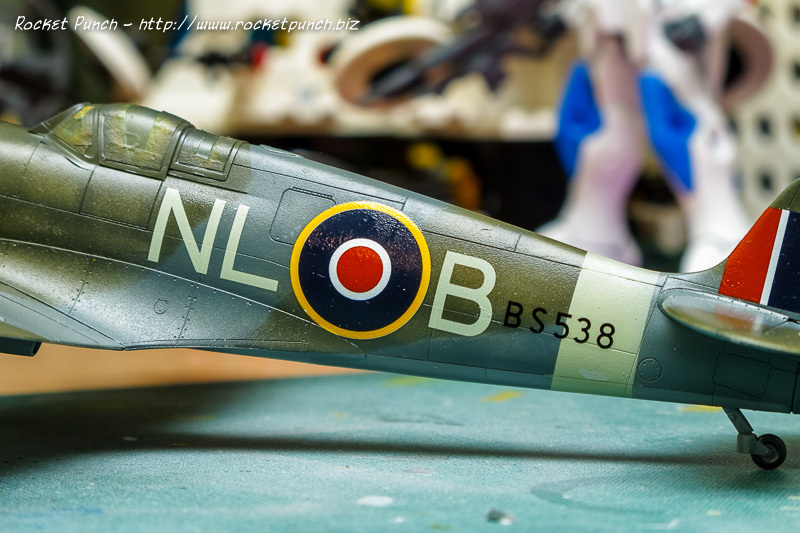 In my decals stash were 3 remaining markings from the Eagle Strike 48059 British Thoroughbreds Spitfires Mk V/VIII/IX. I chose to do Pierre Clostermann’s markings. Clostermann is the highest scoring French Ace in WW2. He did it all while flying for the RAF. The sheet only came with 1 set of stencils (which I’ve used already previously) so I had to mix and match with the kit’s decals. 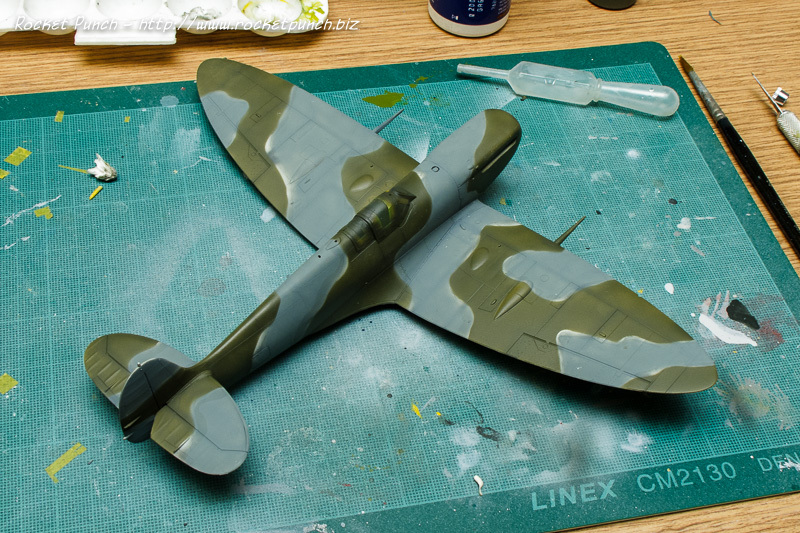 One good thing about WW2 subjects is the general lack of stenciling compared to modern subjects. 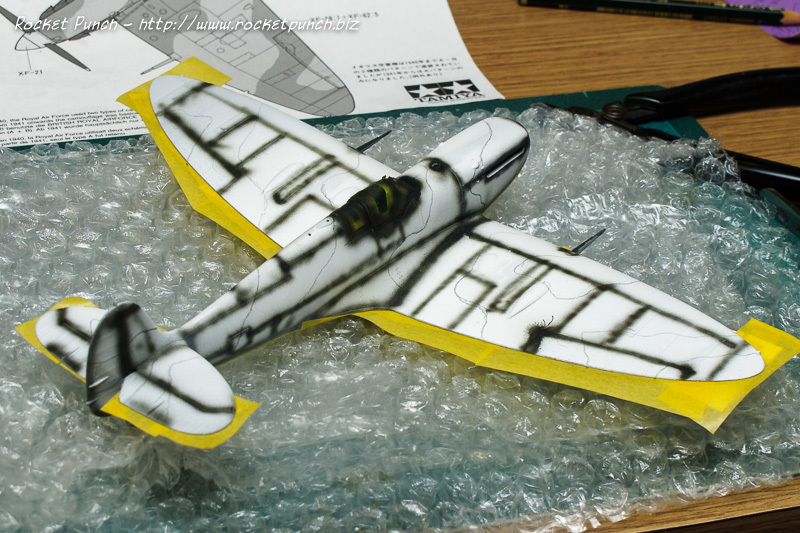 However, the Eagle Strike decals proved to be quite thick and resistant to Mark Softer. 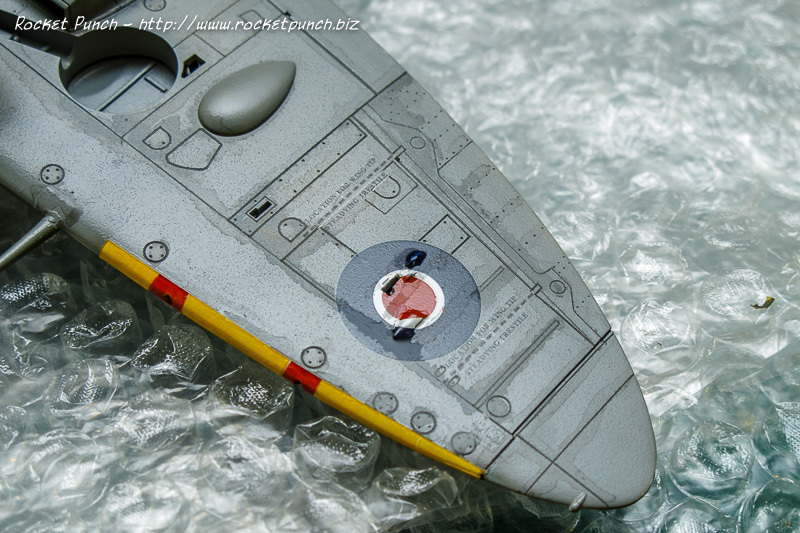 On the other hand, the Tamiya decals were very fragile with some shattering when detached from the backing. They also both took their time to separate from the backing. 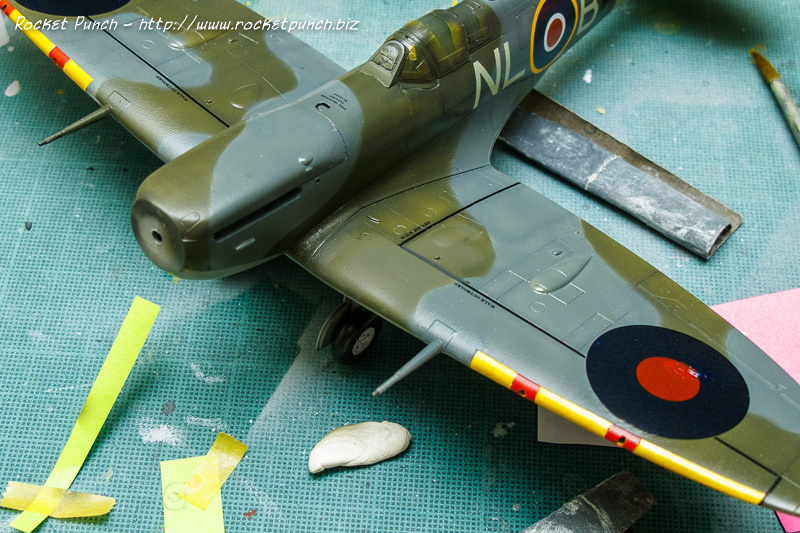 Some of the decals are also supposed to be placed on compound surfaces which caused some breakage and will need to be fixed. 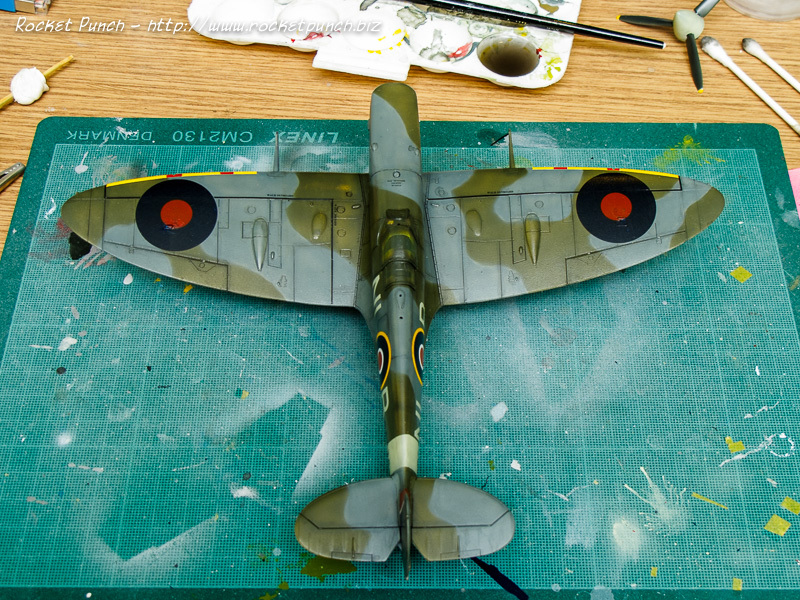 I tried cutting pieces out of the remaining decals to patch up the broken ones but it proved to be time consuming and at all effective so I simply touched up by hand painting. I had to mix some of the paint to get as close as I could. The work wasn’t perfect but it’ll have to do. I was hoping subsequent gloss and flat coat will hide some of the imperfections. And then the 1st disaster struck. 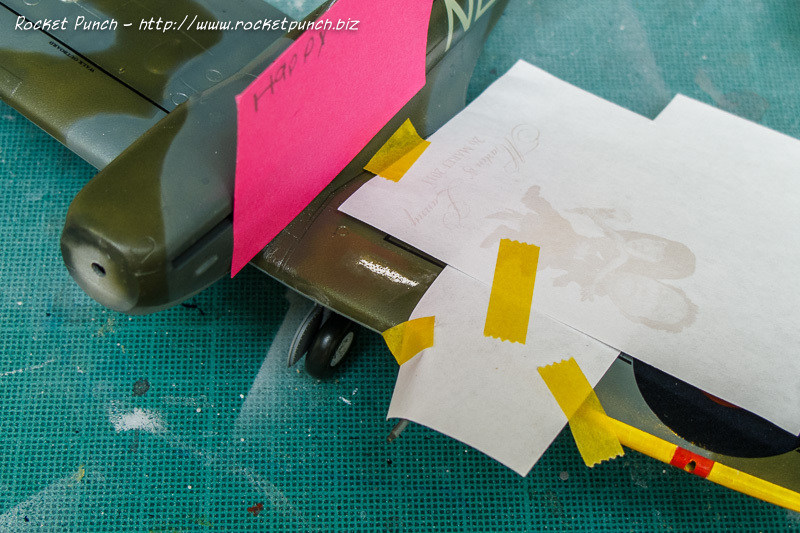 To seal the decals I layered on Future and it was so thick it pooled on some of the surfaces. I carefully removed the pool of Future with windex which caused more than the Future to be removed. Yep. The white is the primer coat. 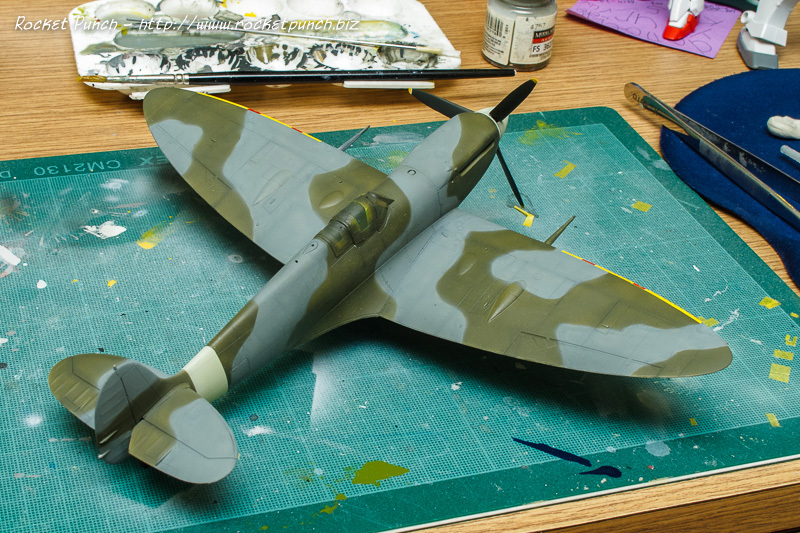 So then I carefully masked (making sure none of the masking tape touched the decals), then carefully sanded the offending area down, then carefully airbrushed the color. 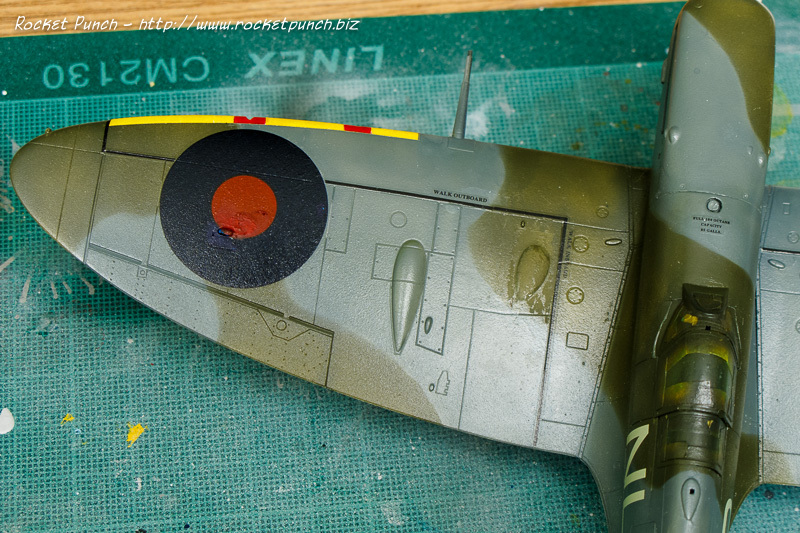 In the end, I also had to respray some of the black walkway line as I got some green on the original decal. At least it came out OK. 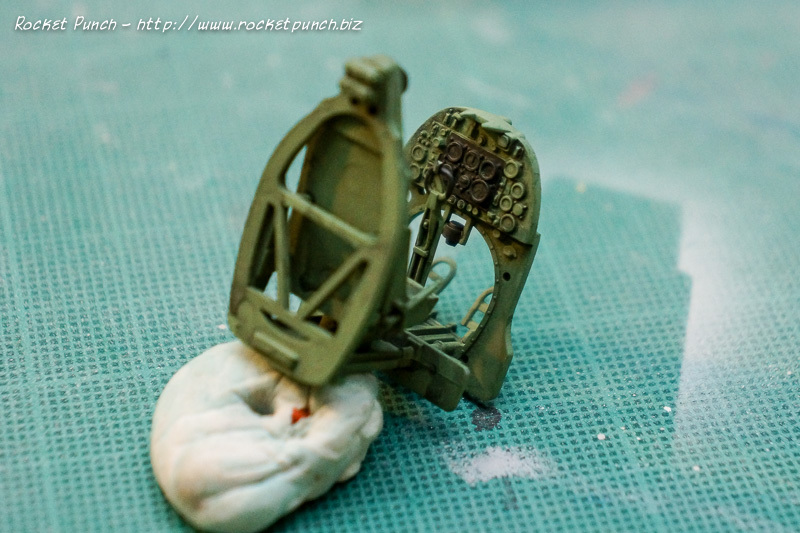 I then hand brushed on Future to gloss up the fixed areas to prep for panel lining. 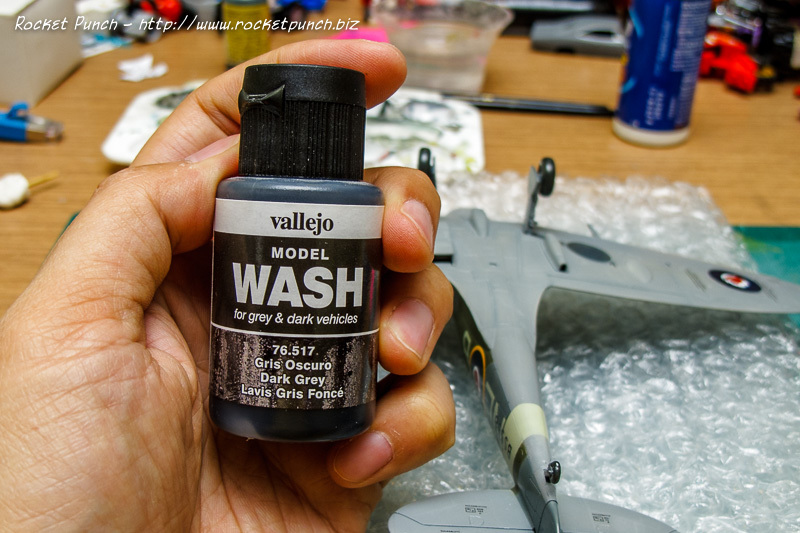 For panel lining I decided to try something new: Vallejo’s Model Wash. It’s a water soluble solution that’s supposed to be used straight out of the bottle. However, I’ve read that it’s better to thin it first before use so I decided to just try it at 1 part wash to 5 parts water. Using it was simple enough. You simply brushed it on and let capillary action help to get to all the nooks and crannies on the kit. Let it dry a bit, then use a wet cotton bud to do clean up. Not intense enough for you? Just go over again until you’re happy with it. I have to say it’s easier to clean up than the usual oil paint + turpentine mix as the wash doesn’t streak as easily as the latter mix. I was finished in no time at all. Next I added the antenna. This will need to be touched up a bit. 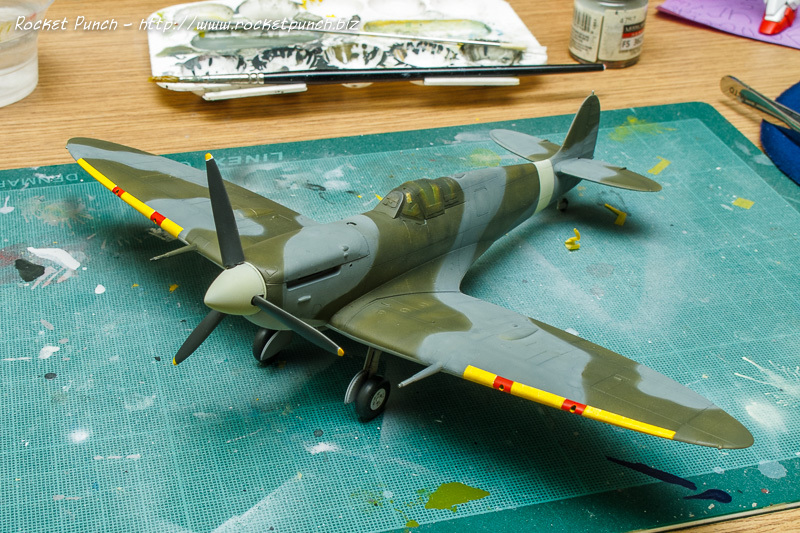 After this is the final flat coat, removing the masking tape around the canopy and attaching the rear view mirror, exhausts and spinner. And I’m all done! 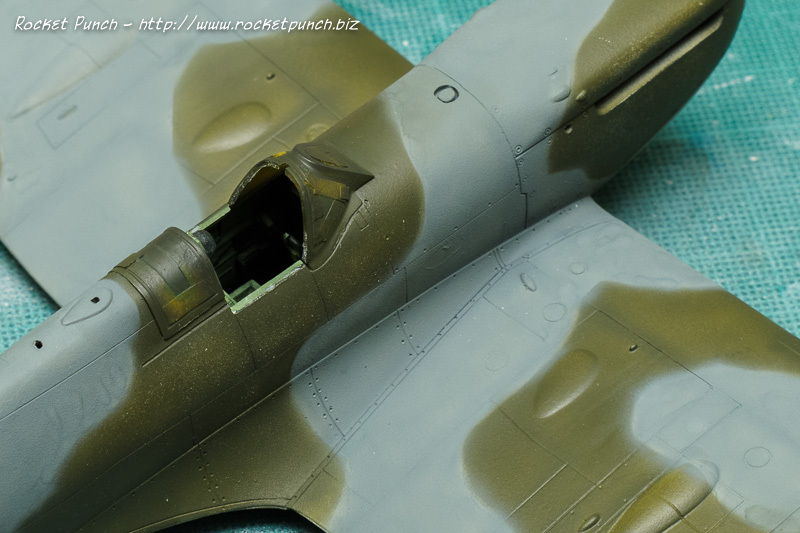 Now it’s time to cleanup the camo. First up, I painted all the gaps that I missed out the first time round. 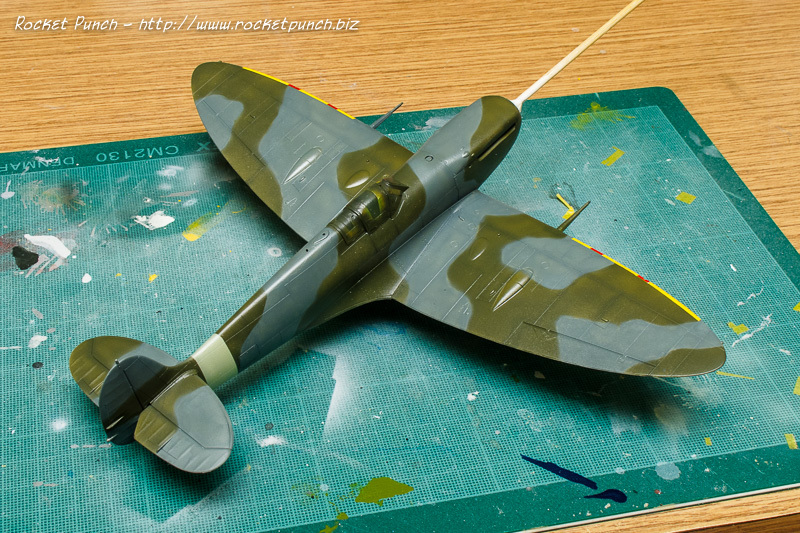 I also took the opportunity to finetune the camo by using blutack on specific spots. Sometimes the camera sensor catches more than the eye can see. This close-up pic clearly shows a very dusty surface even though eyeball 1.0 can’t see them. Then the first disaster struck. The canopy fell off and during the process of re-cementing, some paint got melted off. This required some sanding and buffing again. 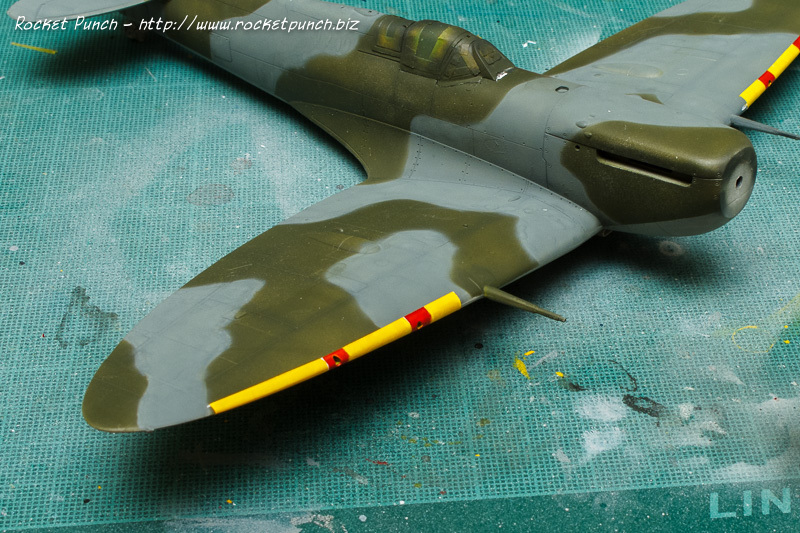 I then handpainted the yellow and red sections on the front of the wings. These were masked, painted white, then insignia yellow, and more masking before painting insignia red. Next I quickly put the spinner together. 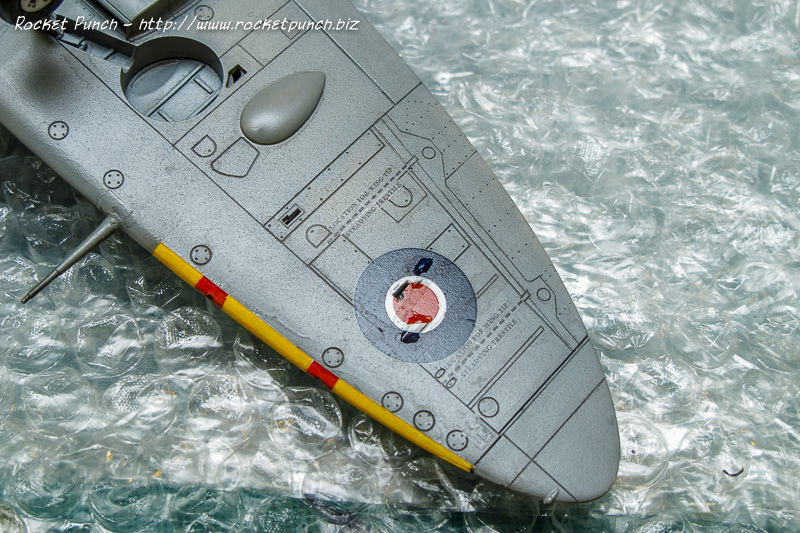 The nosecone was Lifecolor Sky UA095 (I also masked and sprayed the fuselage band in this color). 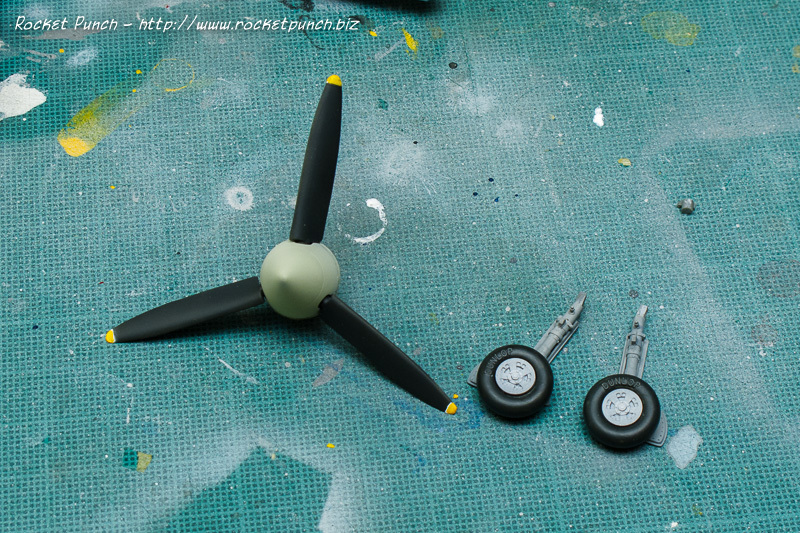 The propeller blades were sprayed with Vallejo Model Air Black Grey 056 and the tips were handpainted the same way as the bands on the wings: a base of white with insignia yellow. 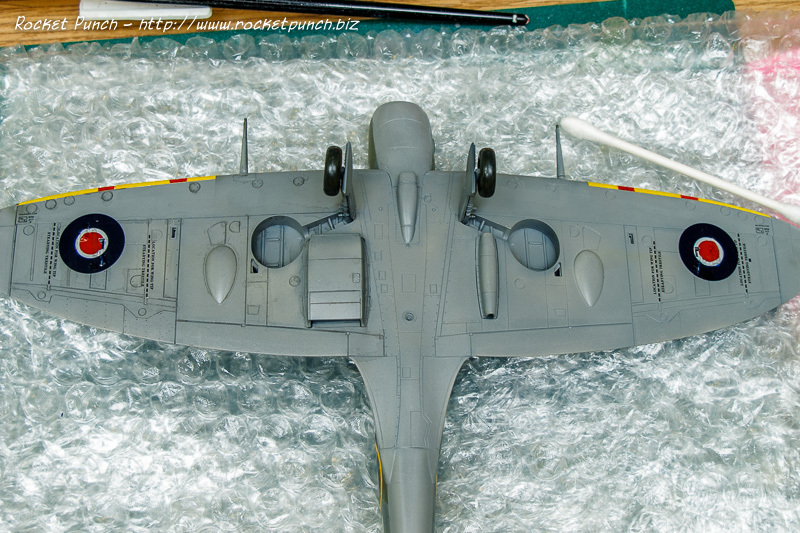 The landing gear is all Model Master Acryl Neutral Gray 4757 with the tires Model Air Black Grey. The landing gear was attached and I then did final touchups to fix bleeding of paint and other spots that didn’t look quite right to me. 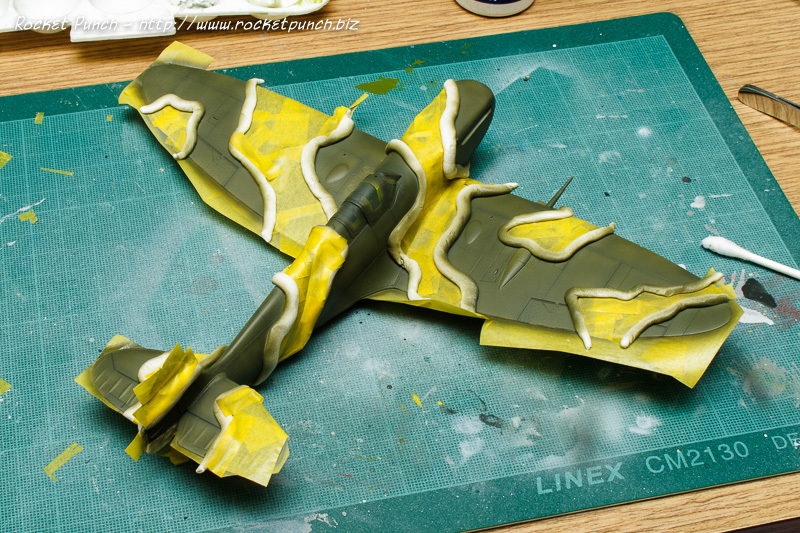 After I let the paint cure for another day or so, it’s time to glosscoat and start decaling. Painting begins. 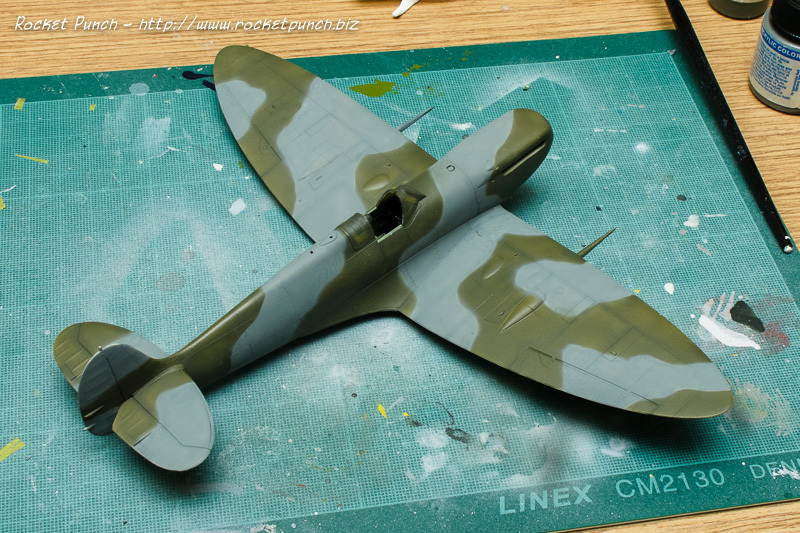 The Spitfire I’m modeling is primarily 3 colors: Medium sea grey bottom with ocean grey and dark green up top. First up, the bottom. Based on some research, Model Master Acryl Neutral Gray 4757 is a close match to medium sea grey. 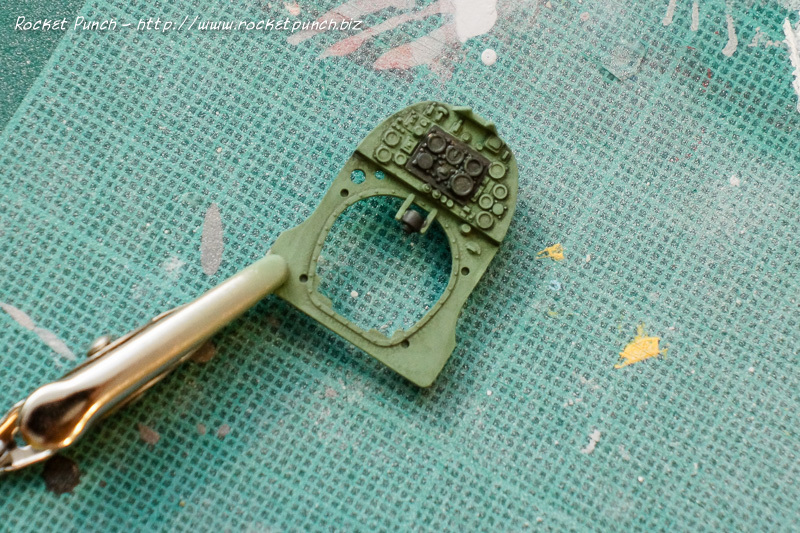 As acrylic paint chip easily, I let each color cure at least 24 hours before masking. Obviously, masking off the bottom is next. 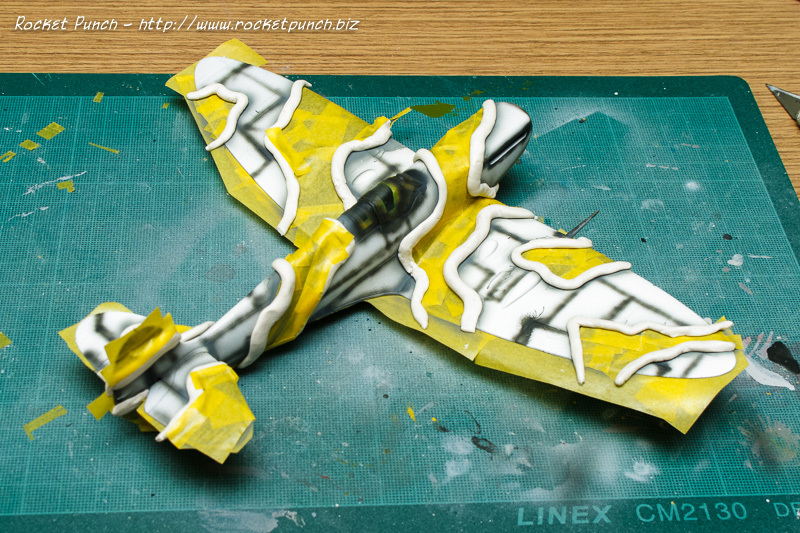 I used a pencil to lightly draw out the camouflage pattern on the fuselage. Then for the ocean grey up top, I went with Lifecolor Ocean Grey UA093. 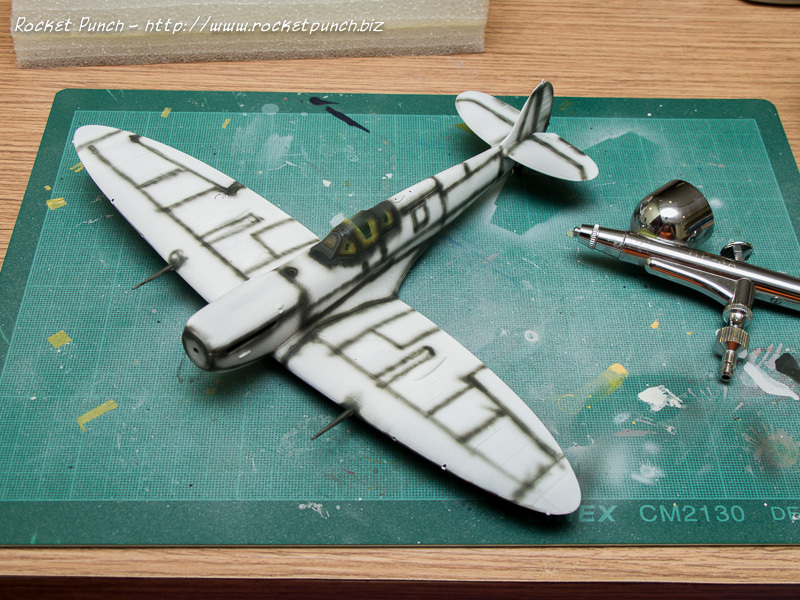 I then masked off most of the grey and for the edges, I used rolled blu-tack to do the demarcation lines. I don’t trust my free hand skills so the blu-tack will allow me to have a harder separation between the two camouflage colors than doing it free hand. For dark green I went with Vallejo Model Color US Dark Green 893. 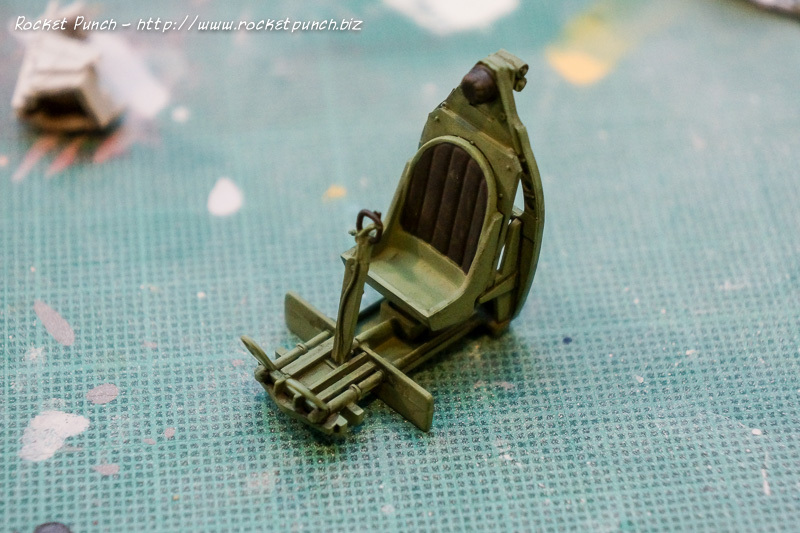 And yes, it still needs some cleanup but I’ll need to wait for the dark green to cure first. Next time though, I think I’ll just lay on the first color over the whole kit, then the second color with blu-tack masking. Much less cleaning up to do for sure. I’m getting closer to the finish line at least! I’ve been on and off this one for quite awhile (as is usual haha). But finally, some progress. So here it is. 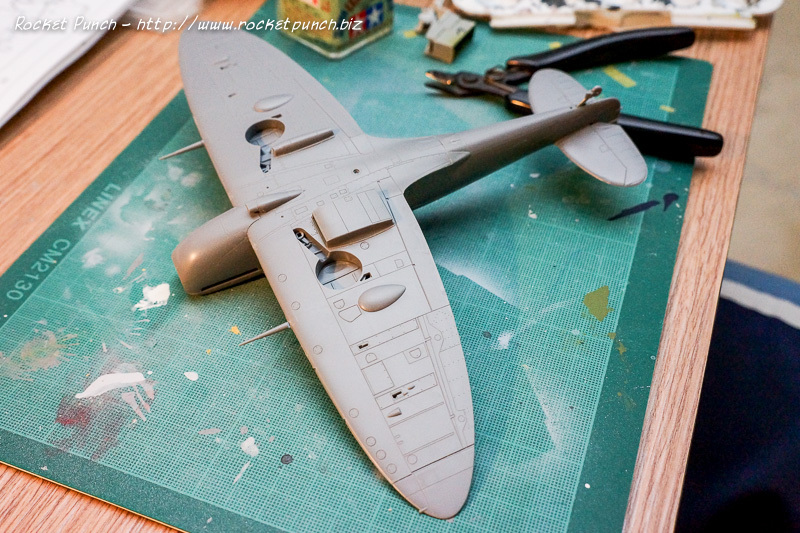 Anyway, this kit will pretty much be OOB except for perhaps the decals. 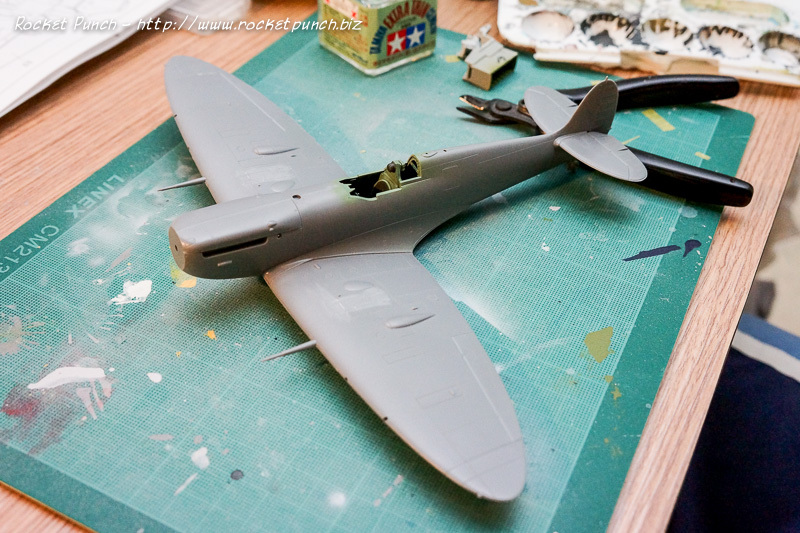 I decided to close the canopy and with it being so small, the lack of safety belts is not a big issue. 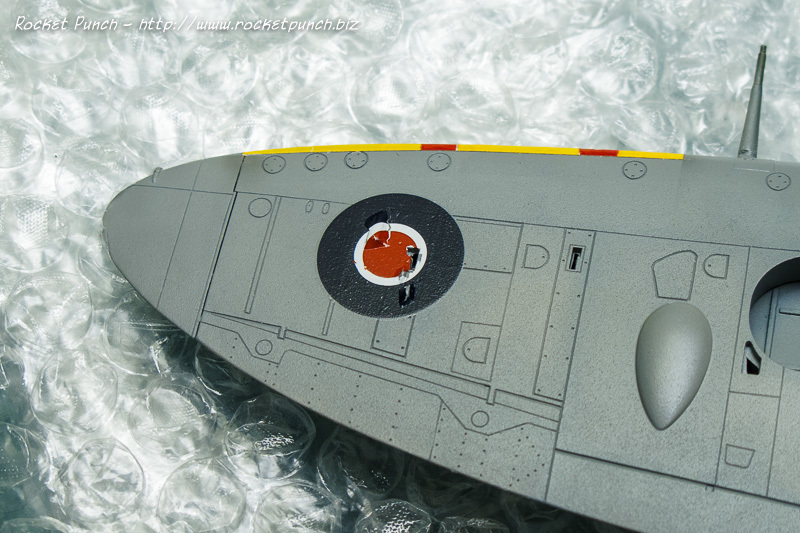 I went with Lifecolor Green RLM99 (UA060 ) for the interior. Not sure how accurate it is but based on various sources it should be close enough. The details were then given a wash of black gray. Yeah, ugly ejector marks. But they can’t be seen when the fuselage is put together. 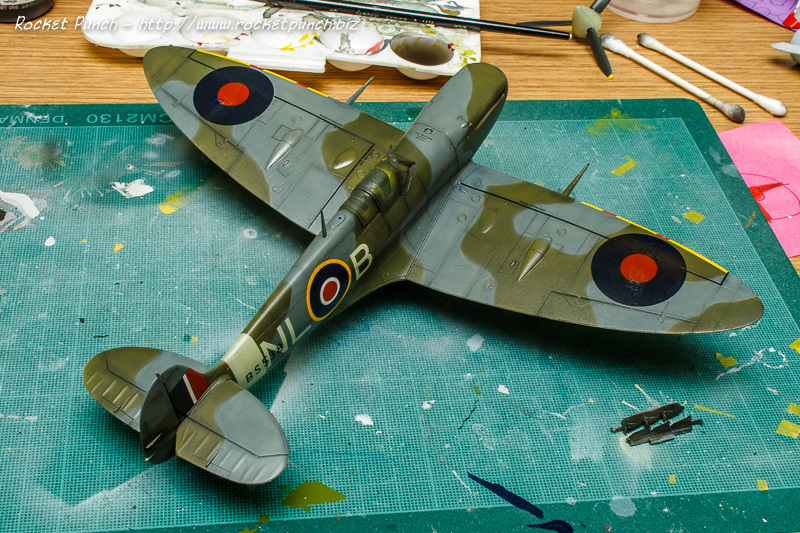 As per usual for WWII aircraft kits, the Spitfire doesn’t have too many parts. 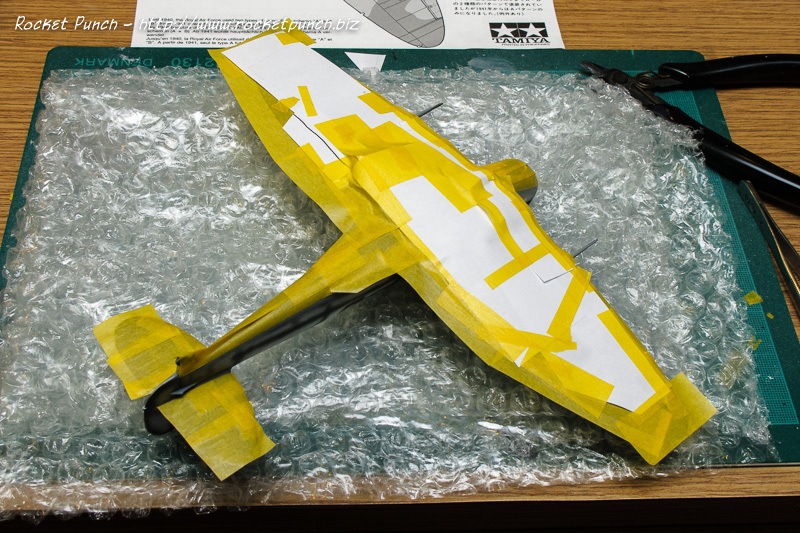 I chose to do the version with the rounded wing tips and had to remove 2 wing fences on each wing (I think this kit recycles the wing from the Mk.1 boxing). Other than that, nothing else needs to be modified. The kit is as close to ‘shake and bake’ as can be and came together with no fuss. 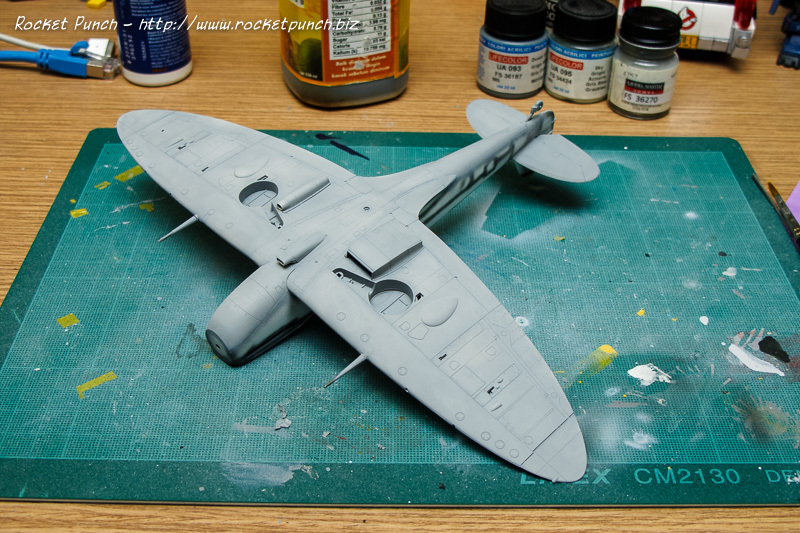 After a few rounds of fixing the seamlines I used spray can Tamiya white primer as a base coat. 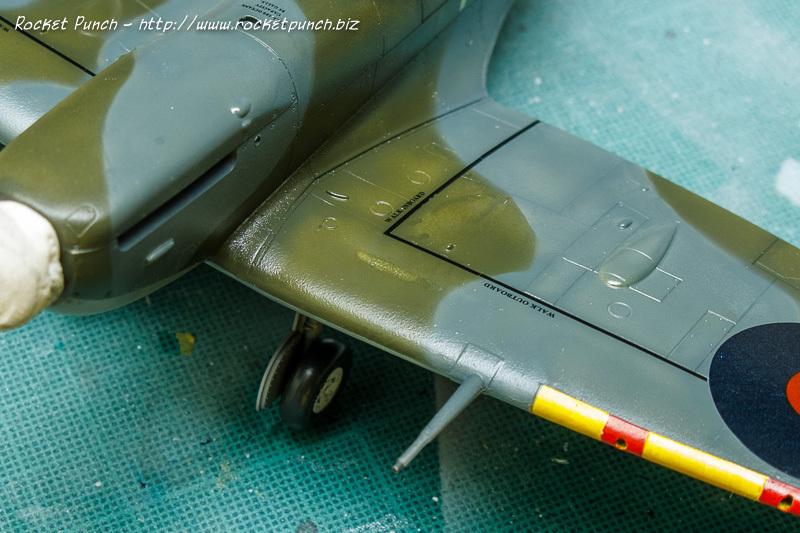 The 3 part canopy was dipped in Future and masked with tape and liquid mask and cemented on. Preshading is next. 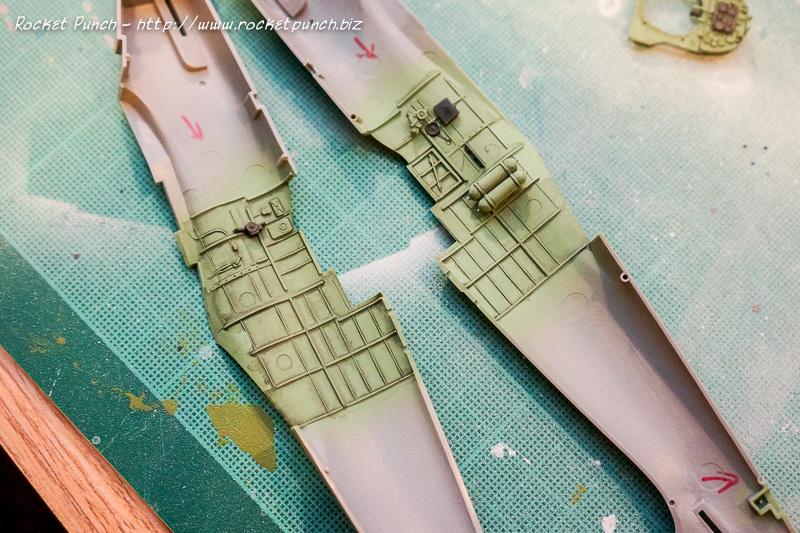 I usually don’t preshade every panel line but I do make sure the canopy frame lines are properly covered. 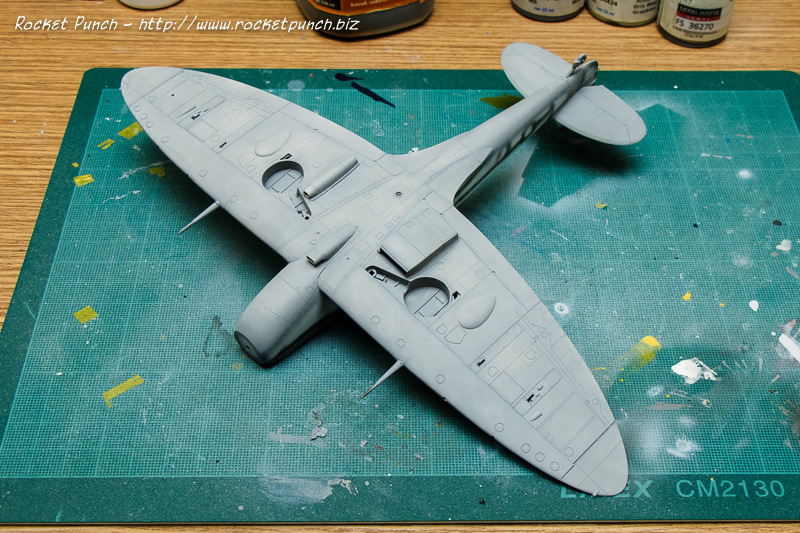 I also preshaded the other major parts (not pictured): nosecone, propeller and landing gear.